Carol Reardon, Tom Vossler. A Field Guide to Gettysburg: Experiencing the Battlefield through Its History, Places, and People. Chapel Hill: University of North Carolina Press, 2013. Illustrations, maps. 464 pp. $22.00 (paper). "According to recent estimates, there are over sixty-five thousand books written about Gettysburg, with subjects ranging from the memory of Pickett’s Charge to the menu at General Pickett’s Buffet. 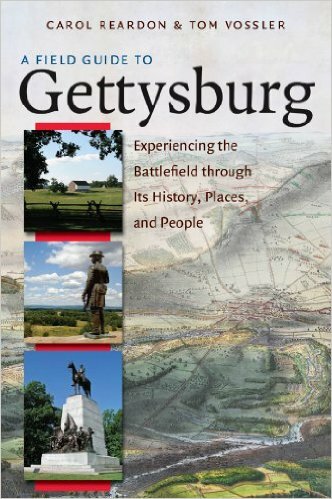 None of these books accomplish what Carol Reardon and Tom Vossler have achieved with A Field Guild to Gettysburg: Experiencing the Battlefield through Its Historical Places and People. As its title indicates, the book allows the reader to reconstruct, interpret, and essentially understand the Battle of Gettysburg through the eyes of those who fought. Although A Field Guide to Gettysburg generally follows the Park Service auto tour, there are several additional opportunities that make this anything but a standard excursion. "The book is divided into three main sections, one for each day of the battle, and each section is subdivided into chapters that follow that day’s events. Each chapter is broken into subsections that correspond with one of thirty-five tour stops. Tour stops begin with an orientation that allows the reader to pinpoint the location on one of the corresponding forty-seven maps and to begin to understand the significance of the battlefield itself as a primary source. "Next, the authors ask “What Happened Here?” and provide a few paragraphs of powerful prose describing events that took place at that location. The authors often use the words of soldiers, from officers to enlisted men, to develop the narrative and accordingly, put the reader into the action. The clearly drawn maps depict troop movements, some down to the company level, facilitating an understanding of the battle from the soldier’s point of view. To further explore the action from this perspective, Reardon and Vossler then ask “Who Fought Here?” and “Who Commanded Here?” These areas of investigation describe the troops engaged as well as the personalities involved. All of this makes the following heading “Who Fell Here?” that much more powerful. The use of individual vignettes helps illustrate that each number in a casualty report was an individual, a real human being, not merely a statistic or a name in a history book tucked away on some dusty bookshelf. Indeed, the authors often examine the impact of death upon a soldier’s family, thus personalizing the battlefield. For several tour stops, the authors include the heading “Who Lived Here?” that considers the civilians of Gettysburg whose lives were disrupted and in some cases destroyed by the carnage of battle and its lingering aftermath. The study of each tour stop concludes with the heading “What Did They Say about It Later?” offering the reader a consideration of how Gettysburg began its evolution in historical memory. "It is not uncommon to see visitors to Gettysburg traipsing across the battlefield with the Official Records in one hand, a map in the other, and a backpack loaded with the complete works of Harry Pfanz. To a great extent, A Field Guide to Gettysburg eliminates the need to carry that weight. Reardon and Vossler have provided an instant classic in a single volume that is both eminently readable and exceptionally useable, ideal for those participating in staff rides, educational tours, or a self-guided exploration of the battlefield. Even if one lives nowhere near the battlefield, A Field Guide to Gettysburg is a perfect companion book to supplement traditional Gettysburg monographs. The Federal Victory at The Battle of South Mountain, Maryland: Why Was It a Strategic Diaster for McClellan ? McClellan's Big Miss, Ronald Soodalter, MHQ: Military History Quarterly.29:2, Winter, 2017, pp. 76-80. Union commander George B. McClellcm won the Battle of South Mountain in 1862. So why was it such a strategic disaster? "In the annals of warfare, it is beyond rare that the commander of an army is given the enemy's battle plans. Yet that is precisely what happened in September 1862, when a copy of Confederate general Robert E. Lee's Special Orders No. 191 fell into the hands of the commander of the Union's Army of the Potomac, Major General George B. McClellan. It was, in the words of historian Bruce Catton, "the greatest security leak in American military history," and for a moment it gave McClellan the opportunity to end the Civil War--an opportunity that was, tragically, squandered." "Ultimately, though, the responsibility rests with McClellan. With superior forces and the intelligence in hand to bring the war to an end, he failed to take advantage of the opportunity. Catton, in his timeless Army of the Potomac Trilogy, faults McClellan for a fatal lack of urgency: "With everything in the world at stake, both for the country and for McClellan personally, why couldn't the man have taken fire just once?" "Although the Battle of South Mountain caused Lee to rethink his strategy, a far bloodier confrontation lay just ahead before Lee would abandon his Maryland Campaign. By failing to destroy the Army of Northern Virginia after South Mountain, McClellan gave Lee enough time to solidify his position and ready his forces for the major battle that would follow within days." "The Rebels would remember it as the Battle of Sharpsburg; to the people of the North, it was Antietam, and it would claim some 23,000 casualties, making it the bloodiest single day of combat in the nation's history. And once again, despite possessing superior numbers, McClellan--through an excess of caution bordering on timidity--would fail to seize a second opportunity to destroy Lee's army. The war was destined to last another two and a half years, and to tally a butcher's bill of three-quarters of a million lives. " "The Battle of South Mountain is generally viewed as a tactical Union victory. Late on September 14, Lee himself stated matter-of-factly, "The day has gone against us." It was, however, a strategic disaster for McClellan. Through a series of inexcusable delays, the Army of the Potomac's commanders--having squandered so much precious time--failed to follow up their success in the South Mountain passes with a decisive move against Lee"
"When Lee was first informed that Crampton's Gap had fallen, he ordered Fox's and Turner's Gaps abandoned, intending to lead his men back into Virginia. But word soon reached him of the surrender of Harpers Ferry, and--with the reunification of his army--he instead determined to confront the Army of the Potomac in open battle a short distance from South Mountain"